One of the ‘left overs’ from the Hemsby Havok page is a couple of rolls of Holga 120mm film. I took a roll of Kodak colour film and a roll of Ilford B/W (both out of date) with me. Unlike iPhonography its old school point and shoot with no preview or review. I very mush intended to make use of every exposure and tend part wind the frames so there are double exposures and near panoramas. 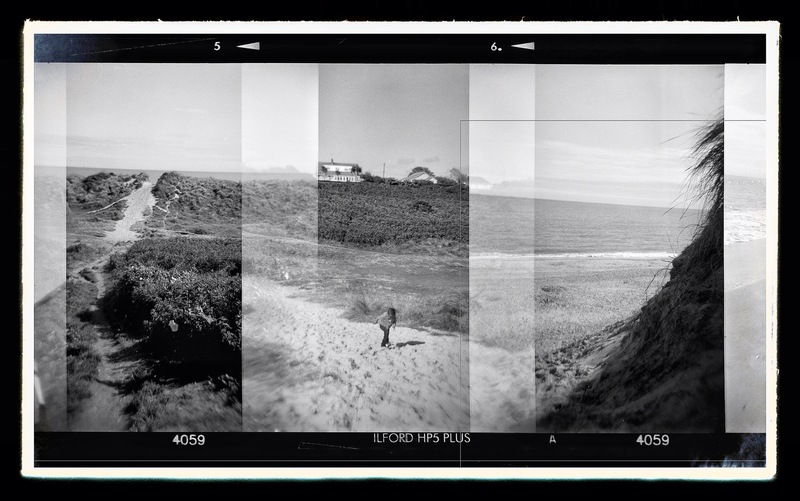 After getting the film developed (or washed, a phrase I like) I get them scanned as a single strip and then chop and process them on iPad in Snapseed (with a little bit of Photoshop). These are mainly taken on the dunes or on the beach. I’ve not added any imagery or cleaned them other than a little sharpness & contrast. They have the vagary of memory, fleeting and not entirely accurate. I still find them evocative. This is the first set from the colour film roll. I had the view set to 16 frames so the individual frames are a little more portrait than the 12 view. Click on any of the images for full screen view. The second set are from the B/W film. The linear & text artefacts are from the editing process, accidental but included for continuity. One final addition, also a result of road trip is a musical piece. There are little roads and alleys in the are near where we stayed called ‘The Craft’ and ‘The Loke’ (bar, bolt) which to my mind have a slightly witchy and medieval connotation. For that reason this ‘song’ uses (just like the ‘Hounds of Love’) a little background noise from the brilliant movie ‘Night of the Demon’. There are 3 or 4 basic levels of slide guitar noise used in this, all recorded one evening after the children had passed into exhausted reverie, using the CBG guitar, iRig and Amplitube. Its turned out unexpectedly very much as I’d intended. This is ‘The Great Yare’ My advice is to play it loud.